With its introduction in 1989, the Atari Lynx was the first handheld videogame system to include a color LCD. The gigantic size and equally gigantic price tag did not win-over a massive audience, but that doesn’t mean the Lynx was without its fans. Over the past few months a modder named [Jared] has been toiling away with his project to transform an Atari Lynx into a home console. The inspiration behind the mod was the original Atari console, the Atari 2600. [Jared’s] console mod, called the Atari Lynx 2600, utilizes a four-switch 2600 case as an enclosure. However, since the Atari 2600 joystick did not offer enough button real estate an NES controller was used instead. A male-male serial cable serves as the new controller cord, while all the buttons on the face of the Lynx are hardwired to a female DB9 port. As an added touch a custom 3D printed cartridge adapter was incorporated into the original 2600 cartridge slot. Since the Lynx did not natively support video out, and intermediary device known as the McWill LCD mod kit was used. The McWill LCD mod is typically done in order to modernize the Atari Lynx’s screen with hardware from this decade, but [Jared] used the kit in order to get VGA video output from the Lynx. Not satisfied with just VGA [Jared] also included a VGA to HDMI scaler inside to ensure a wider compatibility with current displays. Fittingly the HDMI port was placed on the back of the 2600 enclosure where the RF video used to come from. After Nintendo’s wild success with the Wii U, Nintendo released it’s Nintendo Switch. The switch functions primarily as a home console, stagnantly connected to a display. However, Nintendo switched things up a bit: the Switch can be removed from its dock for standalone tablet-like use. But there’s a slight problem: when the Switch is in portable mode, it leaves behind a bleak and black box. What’s one to do? Worry not: [Alexander Blake] is here to save the day with a Game Boy Advance SP and an X-Acto knife. After casually noting that the main control board of the Switch was roughly Game Boy Advance SP sized, [Alexander Blake], aka [cptnalex], knew it was meant to be. After retrieving his broken Game Boy Advance SP from his closet, [cptnalex] set to work turning his Game Boy into a Nintendo Switch dock. When he was done, the results were stunning, especially considering the fact that this is his first console mod. Moreover, the very fact that he did it all with an X-Acto knife rather than a Dremel is astounding. With the screen providing support to the Switch, [cptnalex’s] design leaves some to be desired for long term use. But we know for sure that [cptnalex’s] design does, in fact, work. Due to naysayers of the internetTM, [cptnalex] filmed a video of his dock in uses (embedded after the break). But, what the design lacks in structural stability, it more than makes up for in aesthetics. On the device itself, [cptnalex’s] history with controller painting shines through. If you want to see more of [cptnalex’s] work, you can follow him on Instagram. For more console mods that will take your breath away, look no farther than [Bungle’s] vacuum formed portable N64. With dozens of powerful single board Linux computers available, you would think the time-tested practice of turning vintage video game consoles would be a lost art. Emulators are available for everything, and these tiny Linux boxes are smaller than the original circuitry found in these old consoles. [Chris], one of the best console modders out there, is still pumping out projects. His latest is a portable N64, and it’s exactly what we’ve come to expect from one of the trade’s masters. We’ve seen dozens of Nintendo 64s modded into battery-powered handhelds over the years, and [Chris]’ latest project follows the familiar format: remove the PCB from the console, add a screen, some buttons, and a battery, and wrap everything up in a nice case. It’s the last part of the build – the case – that is interesting here. The case was fabricated using a combination of 3D printing CNC machining. The enclosure for this project was initially printed in PLA, the parts glued together and finally filled for a nice, smooth finish. [Chris] says PLA was a bad choice – the low melting point means the heat from milling the face plate gums up the piece. In the future, he’ll still be using printed parts for enclosures, but for precision work he’ll move over to milling polystyrene sheets. With the case completed, a few heat sinks were added to the biggest chips on the board, new button breakout board milled, and a custom audio amp laid out. The result is a beautifully crafted portable N64 that is far classier and more substantial than any emulator could ever pull off. [Chris] put together a video walkthrough of his build. You can check that out below. A Masterpiece Of 3D Printed Case Modding. With An Ouya. We’ve seen a few of [Downing]’s portabalized console builds before, but this one is his first build in over two years. That’s a lot of time, and since then he’s picked up a lot of great fabrication techniques, making this one of the best looking portables we’ve ever seen. It’s a repackaging of an Ouya, but we won’t hold that against him, it’s still an amazing piece of work. In the build log, [Downing] started off this build by using a 3D printed enclosure, carefully milled, filled, and painted to become one of the best one-off console repackagings we’ve ever seen. The speaker and button cutouts were milled out, and an amazing backlit Ouya logo completes the front. Stuffing the Ouya controller inside a case with a screen, battery, and the console itself presented a challenge: there is no wired Ouya controller. Everything is over Bluetooth. Luckily, the Bluetooth module inside each controller can be desoldered, and slapped on a small breakout board that’s stuffed in the case. It’s a great build, and in [Downing]’s defense, the Ouya is kinda a cool idea. An idea much better suited to a handheld device, anyway. Videos below. It’s not exactly a portable, but [Downing]’s PS2 advance puts all the power of a Playstation 2 in the palm of your hands, all while being more popular that the Vita. For the audio and video, the project uses a Cross Plane, a project from a slightly unsuccessful Kickstarter [Downing] pulled the plug on last month. When the handheld is plugged in to the Cross Plane, all the audio, video, and controller wires are transferred through a pair of cables, with the possible addition of wireless transmission should [Downing] ever want to revisit this project. It’s a great looking project that really highlights [Downing]’s talents as a console modder. He’s also thrown his hat into the Hackaday Trinket contest by engraving the Jolly Wrencher into the back of his project, which unfortunately isn’t seen in the video below. The above pic isn’t a new Wii U controller from Nintendo – it’s the product of the 2013 Portable Build-Off Challenge over at the Made By Bacteria forums. Every year the Bacman forums hold a contest to build the best portabalized console, and like every year this year’s entries are top-notch. 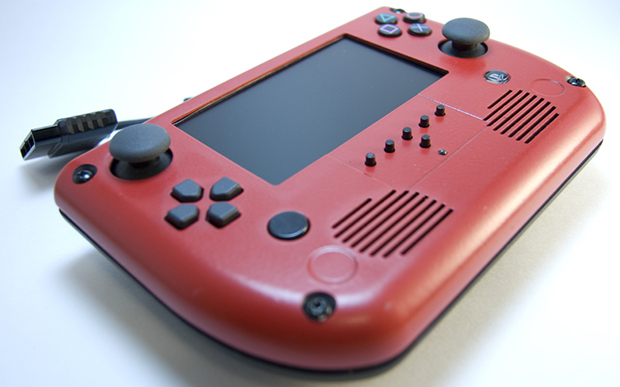 One of the more interesting projects this year is a handheld PlayStation 2 put together by [Gman]. It uses a PS2 Slim motherboard and a dualshock 2 controller along with a 4-inch screen to stuff an entire PS2 into a convenient handheld gaming device. [Gman] ditched the CD drive and opted to play games off the USB drive, a clever substitution that really reduces the size and power consumption. In our humble opinion, the best looking console mod is the one shown above by [Bungle]. It’s a portable GameCube stuffed inside a handmade case with a WiiKey Fusion that allows games to be played off an SD card. It’s an amazing build, and we can only hope [Bungle] will make a few molds of his case. The entire contest has an incredible display of console modding expertise, and is well worth a look. Twenty years ago, [Downing] would fight with his siblings over who got to watch TV. Obviously, this gave him the idea of putting a television inside his Super Nintendo controller, but at he tender age of 12, [Downing] had neither the experience nor skills to make that happen. Now that he’s older, and much less impressed by the Sega Nomad, [Downing] made his dream a reality. Reading over [Downing]’s madebybacteria forum thread, he began the build by adding two controller ports and painting the system a classic Famicom red and white. The prominent feature of [Downing]’s design – a display in each controller – are connected to the console through a second pair of SNES controller ports. Internally, the video signal generated by the SNES is broken out to each controller; the controller displays are just a small mirrored version of whats sent to the TV. Like [Downing]’s previous Genesis portable, the SNES-001 is a master work of Bondo and vacuum forming. After the break you can see a few demos of what this console mod can do.